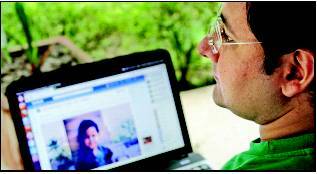 The Times of India, an Indian newspaper featured a story today about a young man who lost his memory because of a chronic disease and then how he gets it back Using Linux, Internet and other modern gadgets and services. Rakesh Sharma, a New Delhi resident, gets a new Intel Pentium 166MHz desktop PC in 1997. Together with his two sons Mayank and Shashank, he installs Linux on it. Life was going good for them but unfortunately in 2009 Mayank was diagnosed with tubercular meningitis (TBM), an infection of the central nervous system. By the end of January 2010, Mayank had lost his memory. After recovering from the disease, Mayank still couldn't remember anything. He was told he was a technology writer by profession, published in several international magazines. Mayank decided that he will do anything to relearn everything and find clues to know who he was. His father and brother taught him to read and write. Then he started off with mobile T9 dictionary that taught him new words. He downloaded and watched BBC radio programmes on pronunciation and grammar. He had a Linux computer to play with. He Google'd himself and discovered articles he had written for various publications, such as Linux. com, IBM developerWorks and many others. He found couple of books he has authored for a UK-based publisher on Google Books. Then he searched for his username, 'geekybodhi' that showed him all comments he had posted on forums. Gmail and Facebook were his next stop. He searched into more than 9000 emails and chat logs on Gmail, found his personal and professional contacts and got to know more about himself. On Facebook he connected with his old friends specially using 'People You May Know' feature. He created a Facebook Page called 'Help me build my Memory Palace', where his friends wrote about him. Next he finds his Flickr page only to rekindle his passion for photography. Apart from these websites he also used old CDs, Linux ebooks, Youtube, Wikipedia, Twitter etc. to get his memory back. Today he uses Ubuntu on his computer and Ubuntu's cloud storage service, Ubuntu One to put up links on his website. On his blog, he writes about Linux, Ubuntu, Wayland, Gnome 3, XFCE, Debian, Fedora etc. My family has helped tremendously in my recovery. We still have that 166MHz desktop. When I saw that computer, I recalled some of the details about the day when we first got it, and the Linux OS that we were trying to install. I had to relearn everything like a new-born. Chronologically, I am 29, but if you ask me I feel no older than a three-year-old - except that I have the ability to articulate my experience. Be it the exhaustive threads hashing out articles and book edits with my editors, or sending out music recommendations to friends, every email tells me something about myself in my own words. Without Facebook, I can't imagine connecting with the people I have connected with. Even if I dug up old phonebooks, how would I reach out to batch mates in Manchester and California or my editors, former and current, in USA and England? Since I didn't know the roads, I used OpenStreetMaps to find my way around. I now record my GPS tracks too. Wikipedia was invaluable in finding out more about any subject. And its "See also" section points you to other related topics, giving context. I had KeePassX set up on my computer which remembered all my old usernames and passwords, making it easy to log into services. I now use LastPass for the same purpose. Apart from helping me in being more creative with my words, I use Twitter to connect with neurologists from around the world.